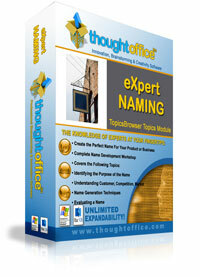 Whether you’re creating a new company, a new product or service, or diving into web site (URL) name development, ThoughtOffice provides you with over 10,985,690 associations quickly and with very little effort. (And compared to the typical $10-$30,000 word development package, ThoughtOffice is one heck of a bargain). Think of it as instant inspiration for when you’re in the mood to do some serious name-calling. So… you can spend thousands or tens of thousands for a professional brand consultant to help you arrive at a name. You can also pick up any number of tools that specifically help you arrive at a name. 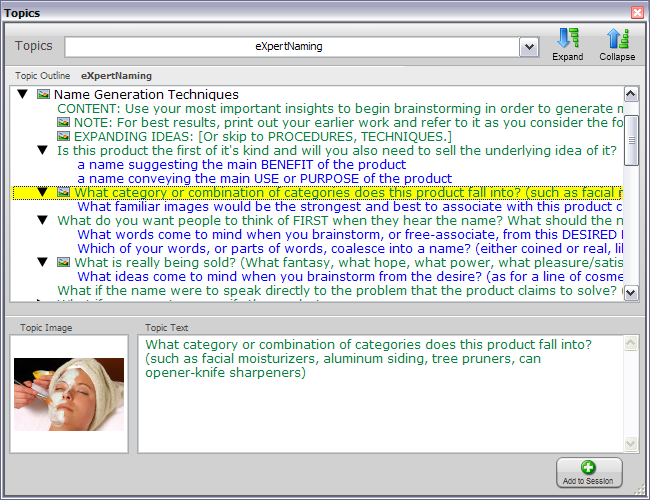 Or you can get ThoughtOffice – the Swiss Army Knife of naming, marketing and advertising tools, flick open the blade marked “Expert Naming”, slice and dice a few words and phrases, and get going on the path to naming success in literally minutes. Then craft creative ads and marketing for that name, build your empire, and retire young.